May | 2012 | Shelf Elf: read, write, rave. Good news! I found a book that finally pulled me out of the ‘meh’ feeling I’ve been stuck with the past few weeks. It’s Minette’s Feast, by Susanna Reich, illustrated by Amy Bates, and it’s a beauty. Guess what? It’s about food and Paris and cats! So of course it’s my idea of divine. I wouldn’t change a single thing about it. I haven’t been able to say that about many books lately. 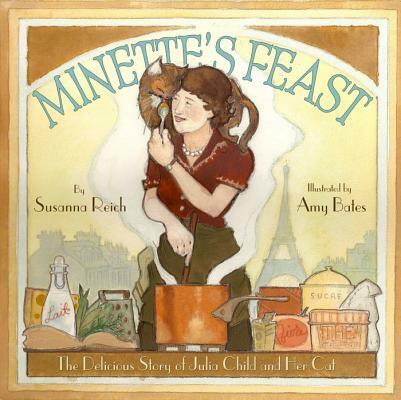 Minette’s Feast is the story of Minette Mimosa McWilliams Child, Julia Child’s cat. She was a tortoiseshell who got her middle name because she once nibbled a mimosa branch that Julia brought home. Of course Minette was one lucky cat, getting to smell delicious smells and taste delicious tidbits made by one of the most legendary cooks. 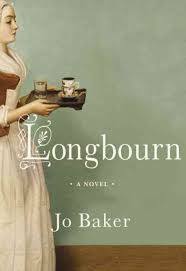 But we learn that no matter the delights Julia prepared for her, there really was nothing so good as mouse. I love that Minette comes across as a real character, as discerning and headstrong and full-of-life as her famous owner. The dialogue in the book is all taken directly from My Life in France and from Julia and Paul’s letters. There are just enough French words and expressions to give the text that Parisian je ne sais quoi, and the watercolour illustrations suit the old fashioned feeling of the narrative perfectly. The muted softness and the free style and warmth in the pictures make the story come across as all the more cozy and cheerful. This book has ambiance. If I’d read it as a cooking-crazed, cat-loving kid, I know it would have immediately become one of my very favourites. This one is worth savoring and sharing. I’m sure Julia would approve. Minette’s Feast is published by Abrams. This entry was posted in Illustration, Non Fiction, Picture Books, YumYum on May 27, 2012 by shelfelf. Do you need to smile today? The past few weeks have left me feeling distinctly “meh.” Meh about the books I’ve been reading. Meh about the cookies I’ve been making. Meh about just about everything. I’m sure I will shake it soon. There is one thing that I stumbled upon today that brought a goofy, opposite-of-meh-smile to my face. Have you heard of Child’s Own Studio? It is probably the sweetest home business I’ve ever heard of. You can send in a child’s drawing of a creature and have it made into an actual stuffed animal. Not Joking. You can view the amazing gallery of stuffies here. If that doesn’t fill up your happiness tank, I’m not sure anything could. Just imagine a kid’s reaction getting one of those? plus a one-of-a-kind stuffed animal would make any creative kid feel like she’d won the Best Gift Ever lottery. Sometimes I feel like there’s so much cool stuff out there that we’ll maybe never even hear about and this thought makes me feel like the world is full of awesome after all. This entry was posted in Just Cool on May 23, 2012 by shelfelf. 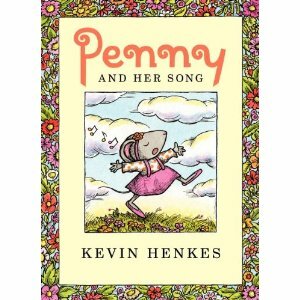 Penny and Her Song is a lovely, simple tale about a small mouse who discovers her own creativity and finds a loving audience to appreciate what matters to her. Kevin Henkes has such a gift for crafting a story that manages to be heartwarming and funny and so very true to a child’s point of view and experience. Penny gets home from school with a song to sing. She wants to do it Right Away, but her mom and dad tell her to wait a little, because the babies are sleeping. Penny has trouble waiting, but she does, and eventually after dinner she has a chance to shine. The whole family has a good time together enjoying the simple pleasure of making your own fun, and pretty soon it’s time for bed. For a story about singing, it has a quiet tone that lets you slow down and appreciate Penny’s sweetness. Henkes captures everyday life, what happens one ordinary evening when Penny gets home from school. It’s nice to see that sort of day-to-day experience take centre stage in a story. I liked how Penny’s parents actually parent in this book. I also like that their “not now Penny” is soon tempered with their willingness to make time to celebrate Penny’s song and jump in to do a little singing themselves. Penny is loved a whole lot – that’s clear – but it isn’t always about Penny. Now there’s a good lesson. Penny is just as endearing as Henkes other much-loved mice. Henkes proves in this story, once again, that it’s the little things that matter to kids, and really, that the kids have it right: these things should matter to all of us. Penny’s Song is published by Greenwillow Books. 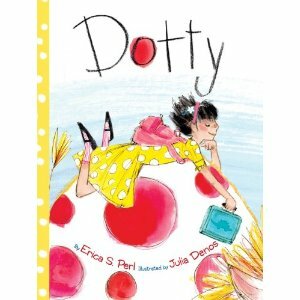 This entry was posted in Illustration, Picture Books on May 16, 2012 by shelfelf. 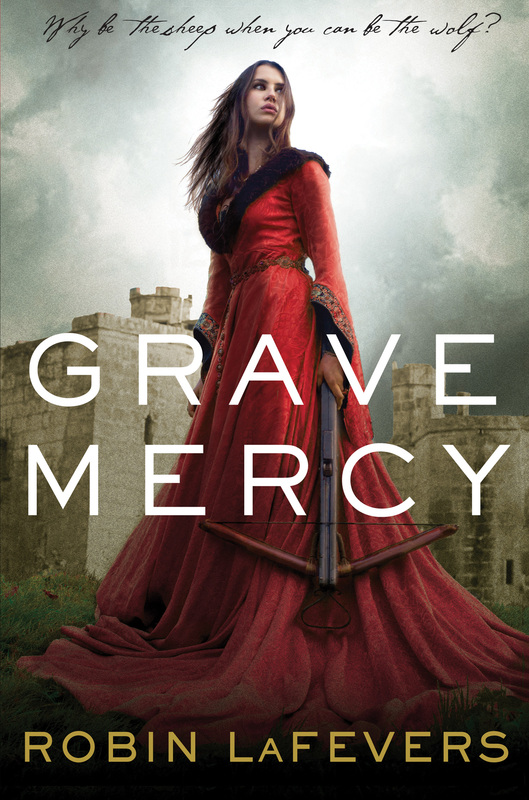 I am in the middle of reading Robin LaFevers first YA novel, Grave Mercy, and I thought it was worth pausing for two minutes to tell you that it’s the first book I’ve read in a long, long time that has been literally too good to put down. Poison, political intrigue, girl assassins, and Romance with a capital R. (Actually, maybe all-caps ROMANCE). I can’t say more because I have to keep reading. I can say it has 4 starred reviews (Kirkus, SLJ, Booklist, and Publisher’s Weekly). Why indeed? Gotta go read now. This entry was posted in Just Cool, Teen/YA on May 6, 2012 by shelfelf.